･ The pass can be used for non-reserved seats on the "Hello Kitty Shinkansen". * For reserved seats, please purchase a Limited Express Reserved Seat Ticket from a JR-WEST Ticket Office or other location before boarding. - Not valid for the IR Ishikawa Railway or the Ainokaze Toyama Railway. * As a special exception, the pass can be used for the Himi, Johana, or Nanao lines only if the pass-holder does not alight from the IR Ishikawa Railway (Kanazawa⇔Tsubata) or the Ainokaze Toyama Railway (Takaoka⇔Toyama). Limited express trains can be used on the IR Ishikawa Railway (Kanazawa⇔Tsubata). If using the Ainokaze Liner rapid service on the Ainokaze Toyama Railway, a separate "liner fare" is required. Booking online(*For reservations made no later than May 20) or purchasing passes from a travel agent overseasSpecial early-bird discount! ･ JR-WEST ONLINE TRAIN RESERVATION will replace JR-West’s Online Booking service on May 21. ･ Ticket prices and how tickets are reserved/received will change accordingly. We appreciate your understanding. ･ Be careful when buying tickets at the station of JR-WEST after visiting Japan without making a reservation on the Internet, the price becomes more expensive. ･ When getting a ticket at the station, please be sure to show the "Booking Confirmation" sent at the time of reservation completion. If you can't show this, we'll sometimes sell at the purchase price (¥16,000) at the station. ･ Reservations can be made using online booking between 27 and 2 days in advance. Reservations cannot be made more than 27 days in advance. * An Adult's or Child's rail pass holder can accompany up to 2 infants (1-5 years old) for free. * The infants from the third one will require Child's rail passes for each. * Babies aged under 1 year old can be accompanied for free. - A rail pass user must be holding a passport issued by a foreign government. - A rail pass user must be entering in Japan as a "Temporary Visitor". *"Temporary Visitor" is a status of residence defined under Japanese immigration law. Step 1. Purchase an exchange order (MCO: Miscellaneous Charges Order) at sales locations outside Japan. * Once issued, MCO must be exchanged in 3 months. Step 2. After entering in Japan, present the MCO with a passport at exchange locations, fill out an application with necessary details, and exchange for Kansai-Hokuriku Area Pass. ･ Tickets for reservations made through JR-West’s Online Booking service will still be receivable from stations even after May 21. Step 1. 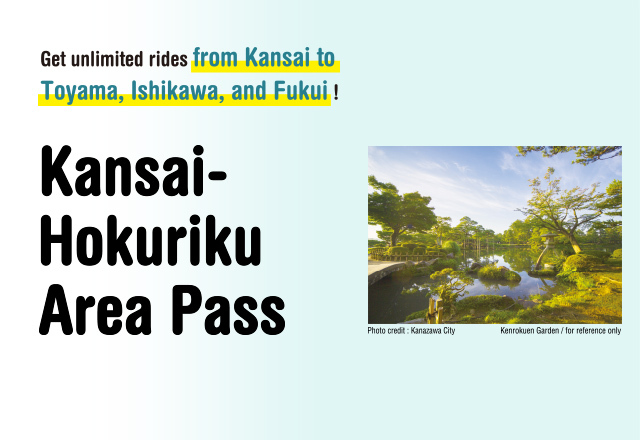 Book Kansai-Hokuriku Area Pass online, receive Booking Confirmation e-mail containing reservation number, and print out the e-mail. *Please print out the Booking confirmation e-mail and bring it to your pick up station to collect your rail pass. Step 3. Pay for Kansai-Hokuriku Area Pass by cash or credit card. Read the Conditions of On-line Reservation before making a reservation. Reservations can be made using online booking between 27 and 2 days in advance. Reservations cannot be made more than 27 days in advance. * Changes to reservation details must be made at least 2 days in advance. Step 2. 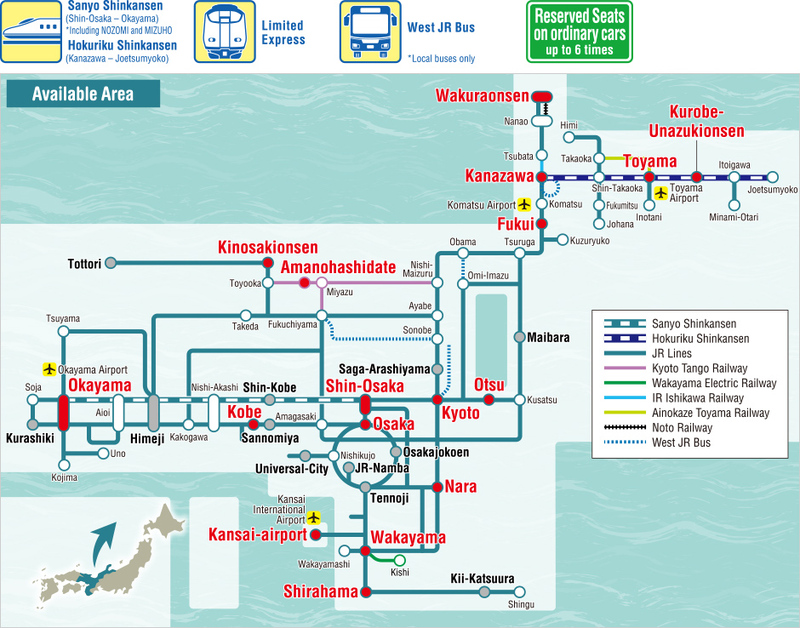 Purchase Kansai-Hokuriku Area Pass by cash or credit card. ･ The following credit cards can be accepted as payment at JR-WEST stations. * Only the card holder can use the credit card. ･ A rail pass is available and usable all year around. ･ A rail pass is purchasable up to 1month in advance of the first day of use. * Currently, reservations can be made using online booking between 27 and 2 days in advance. Reservations cannot be made more than 27 days in advance. ･ A rail pass is valid for consecutive days. 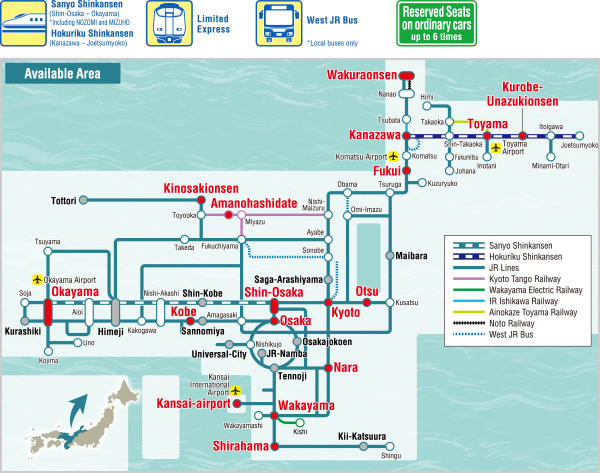 ･ The validity of a rail pass starts from 12 a.m.
Kansai-Hokuriku Area Pass is usable. * When additional tickets are required, obtain the tickets at a JR-WEST station before boarding. * Including "Hello Kitty Shinkansen"
* 1 Separate GranClass Tickets are required. * 2 First Class (Green)/Sleeper Tickets and separate Express Tickets are required. * 3 Separate Express Tickets are required. * 4 Separate First Class (Green) Tickets for Local Services are required. * 5 Separate Reserved Seat Tickets are required. * 6 Separate charges will apply if using carriages / trains that require numbered or liner tickets. ･ The starting date of the rail pass and the duration cannot be changed after purchasing. ･ To change reservations for JR-WEST RAIL PASSES (including ICOCA and HARUKA) other than the Sanyo-San'in Area Pass, use the "Cancellation form" to cancel the reservation, and make a new reservation using the "Booking application form" at least 3 days in advance. ･ A rail pass is only valid for its rail pass holder only. ･ A passport must be carried when a rail pass is used and presented when a JR staff asks to. ･ A rail pass will be void if the magnetic ticket is detached from a rail pass book. ･ A rail pass will not be reissued even if lost or stolen. ･ Conditions of use for a rail pass are stipulated by JR-WEST's carriage conditions and laws of Japan. ･ Conditions of use for an exchange order are stipulated by regulations and contracts of issuing companies. ･ If any discrepancies arise between the foreign language and Japanese versions of the carriage conditions, the Japanese version has precedence. ･ The information displayed [including prices], which is current as of March 16, 2019, is subject to change. Copyright © WEST JAPAN RAILWAY COMPANY all rights reserved.